During Easter weekend Jeff and I decided to head to Athens for a long weekend. We were worried because we thought that Easter would be a big holiday in Greece, and thus everything would be closed. My friend Arin, who lives in Greece now, reassured us though that Greek Orthodox Easter was a different time of the year than Catholic easter. Perfect for us. When thinking of Greece today, I think the first thing to come to mind for most people is the economic crisis that occurred in 2009. 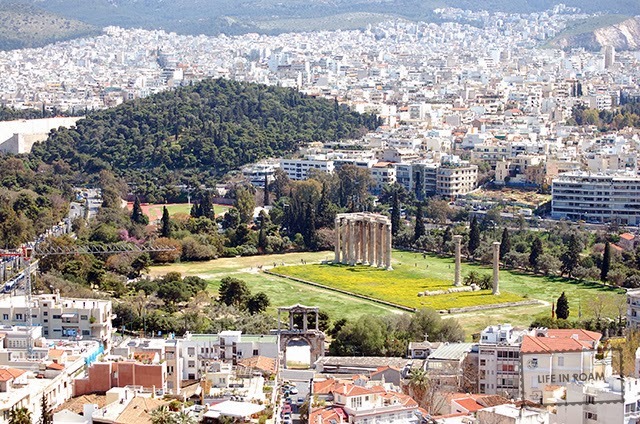 It is easy to forget that the country is the home of Plato, and Aristotle, the birthplace of Democracy, and a city with a history of 3,400 years. The situation with the country’s economy is still unresolved, and seems to still be socially relevant, but as outsiders it did not effect our trip in the slightest. 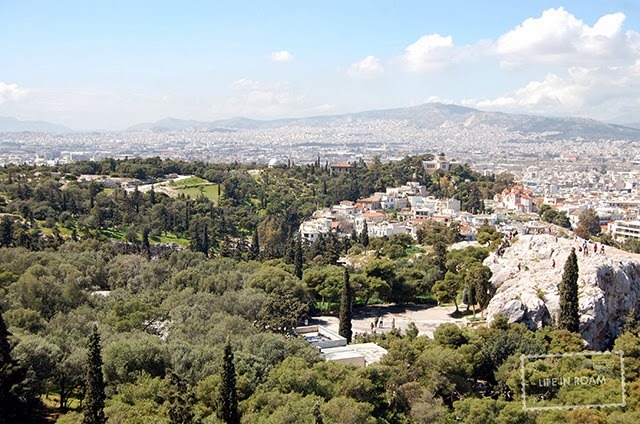 We landed in Athens airport late at night and took a bus into the city. It was very simple and a cheaper option than taking a cab. The only problem was that our printed Googlemap was not detailed enough to find our hotel. Some nice strangers were very helpful in getting us in the correct part of the city though. Usually in new cities, were I don’t know the language, and in the dark, I am very anxious to be around people. 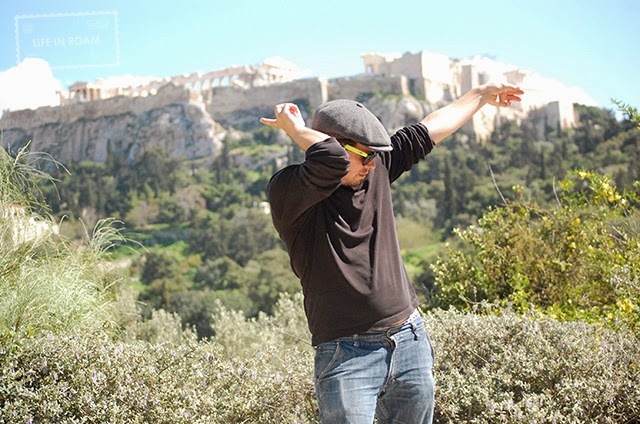 The people who helped us in Athens were so relaxed, that I felt silly for being nervous. Granted we were not far from the touristy part of the city, and maybe not all parts are like that. For the first time ever in our travels though, we simply just stumbled upon our hotel. We had help getting in the general place, but as we wandered through the streets, we found it without explicit help from a map or a person. 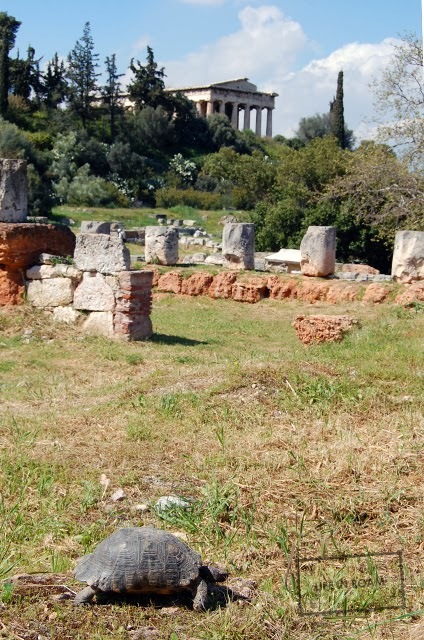 Our first stop the next morning was to the Temple of the Olympian Zeus, which is located near a nice park in a corner of the city. It is the ruins of what was envisioned as the greatest temple in the world, it took 638 years to complete, and was begun in the 6th Century BC. What is lying on the grounds today, are what is left from the original temple. The temple has been pillaged for building parts, abandoned, and left to deteriorate, but in 1886 restoration and protection was implemented. 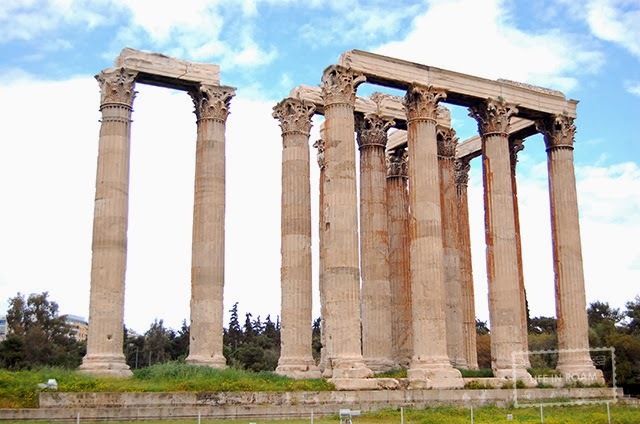 Temple of Olympian Zeus – That fallen column is from a storm in 1852. After these ruins we moved on to the Acropolis, which we were able to get into for free because of our tickets from Zeus. It was an uphill climb, but easily walkable from Zeus with signs pointing in the right direction. 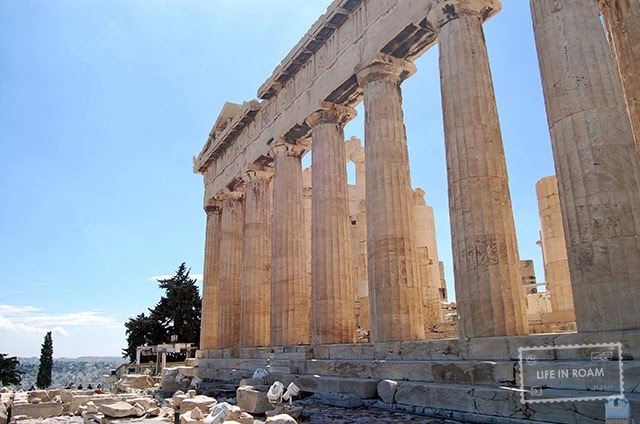 The Acropolis is home to several ancient buildings, including the Parthenon. 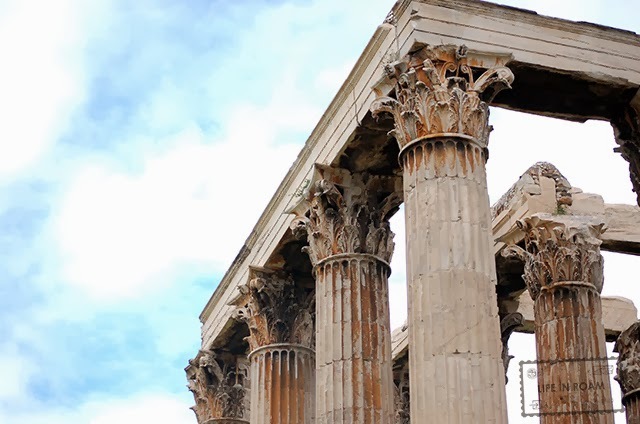 This building is dedicated to the god Athena, but has been at certain points used as a christian church, and a mosque. The building was also being used as an ammunition storage, which caused an explosion that damaged a large part of the building. Surviving statues were removed from the building with permission from the Ottomon government, and subsequently sold to the British Museum in London. The government is making effort to have them returned to Greece. 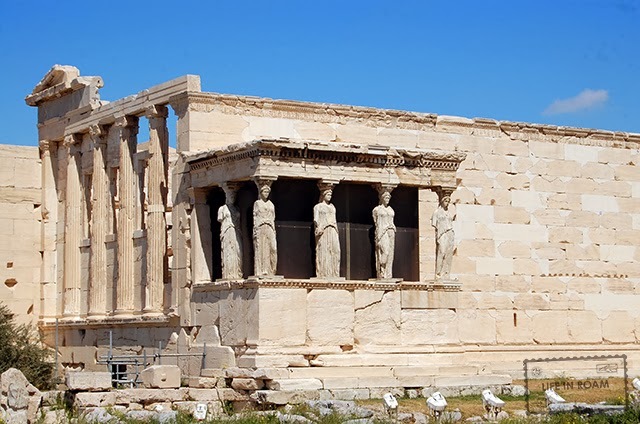 Also in the Acropolis is the Erechtheion, which is dedicated to both Athena and Poseidon. It too was altered into a church during the Roman period, but during the Ottoman period it was used to house the commander’s harem. The statues that hold up the porch today are replicas of the original statues. There were 6 original statues, one was sent to Scotland to decorate someone’s mansion, when he tried to take a 2nd, it broke into pieces. The scottish statue has since been returned to Greece and all of the statues are on display in the Athen’s new Acropolis Museum. Their restoration is being done via lasers and is on display for visitors. 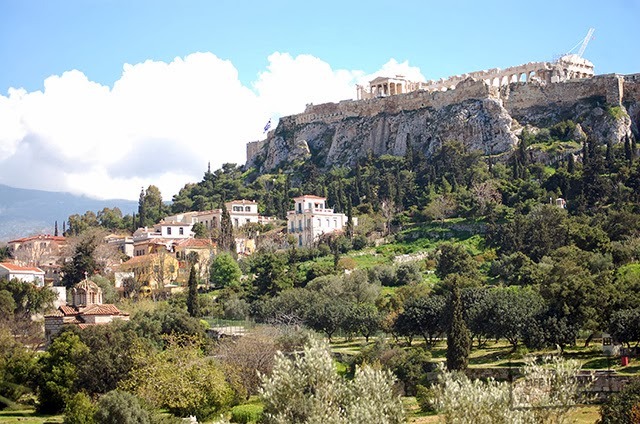 After Acropolis we moved down the hill to more ruins, but also simply more park. As I was setting up the camera timer so Jeff and I could be in picture together, Jeff yells excitably “Niki, come here, quick! Hurry!” I grab the camera and jog over and he is pointing to a turtle that is walking behind some rocks. I look at him and ask, “why did you tell me to hurry? Its a turtle… they don’t run away exactly.” I was teasing though, and was pleased to see the photogenic little guy. Jeff and I spent two nights in Athens, and then the next night decided to try and get to one of the nearby islands. The Greece you see in postcards, with the white buildings with blue accents, are actually on the islands, which are as close as a 30 min ferry to as far as a 3 hour ferry. We stopped first at an island called Aegina, which is very close to Athens. A lot of ferries go there, and we purchased our tickets on the boat, though I think you are supposed to do it before hand. There were a lot of people eager to sell us tickets, so we had to be careful to talk to the right person. We stayed on the island for one night. 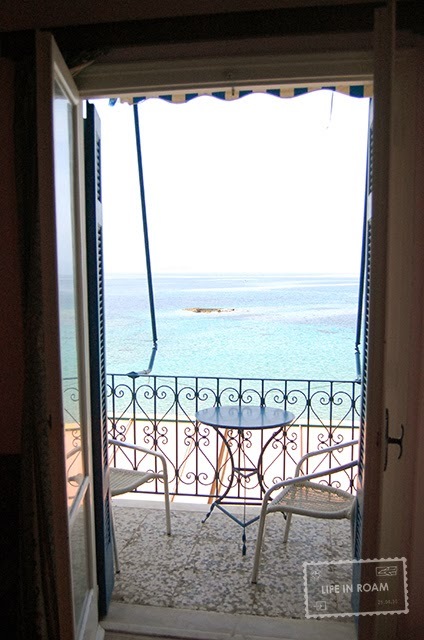 It was a little tricky to find a hotel room since it was the off season, but we eventually found one looking out over the water. The road outside it was loud though, and food in the area seemed to be exclusively touristy joints. 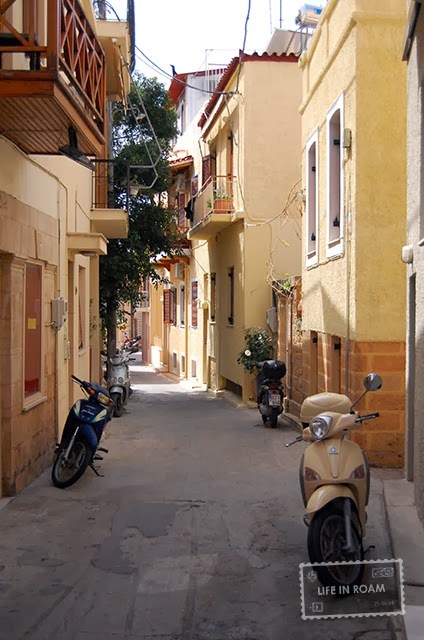 We spent most of the next day wandering around the city, but ultimately deciding to move to another island that I had read about called Hydra. This would be about an hour outside Athens, so still easily reachable. Aegina still felt too much like a city, and we were looking for something a bit quieter. Just before we left, we were sitting on a bench and looking out over the water. 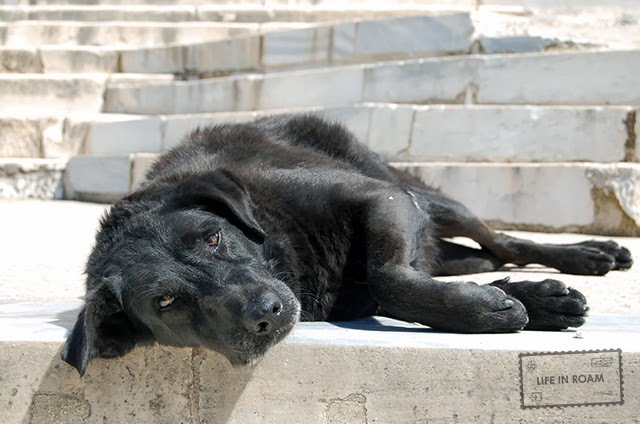 Some yards away from us was a stray dog lying in a huge pile of dry seaweed, doing the same thing. 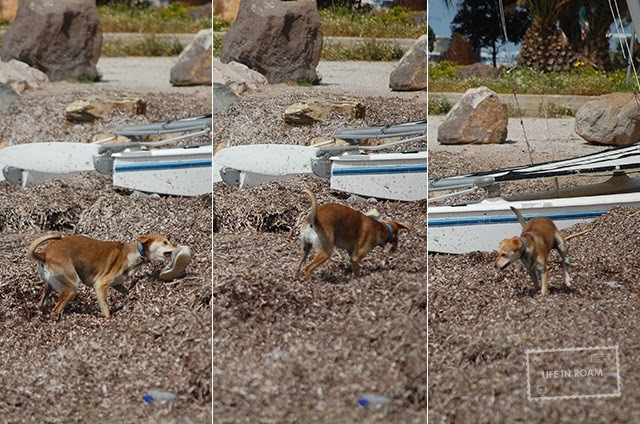 Suddenly, the dog jumps up, runs to an old shoe lying next to him, and starts swinging it around and playing with it. One of the most endearing and adorable things I’ve seen. On second thought, maybe he isn’t a stray, because he has a caller. He was certainly alone though.